The ZIZE-i series is designed for the most favourable life cycle costs and reliability. At the heart of the unit is PolyCross®, our proprietary two-pass step cross-flow heat exchanger. With balanced air flows, this heat exchanger is capable of achieving thermal efficiencies of up to 95%. Moreover, the need for defrosting is significantly reduced due to the size of the heat exchanger and the component material's low surface roughness and hydrophobic properties. Naturally, fewer defrost cycles means lower energy usage. The size and volume of the heat exchanger results in a laminar air flow through the exchanger, in principle encompassing the entire air flow area. 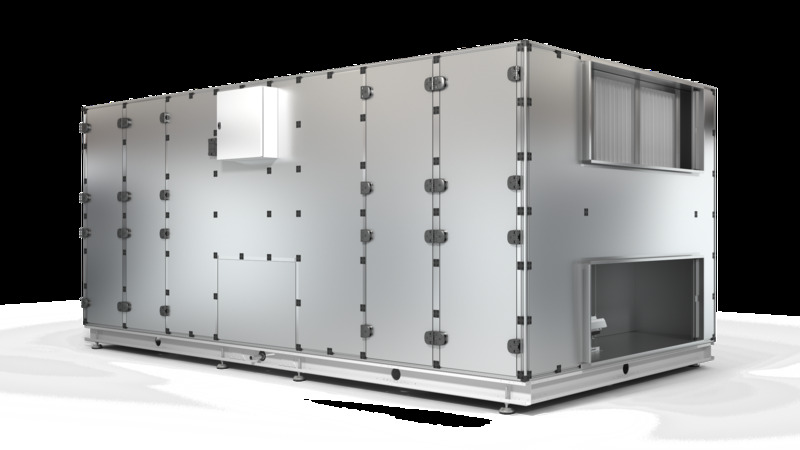 This means favourable thermal recovery even with very low air flows, the optimal solution for a VAV or DCV system. The fans are based on EC technology and the overall result is a highly favourable LCC calculation and minimal environmental impact. These units can be delivered prefabricated or as knock-down kits. A knock-down kit can prove highly advantageous in that the parts can be transported through a door opening as narrow as 600 mm. This means that spaces that are otherwise not viable can be used without any physical alterations to, for example, façades and rooftops. This is particularly advantageous in renovation projects. The ZIZE-i series is designed primarily for indoor installation, generally in a fan room. If necessary, custom units for installation elsewhere can be provided. Relevant documentation for the ZIZE-i series can be found here.